HP still does produce Envy desktop systems but the focus has shifted to more high general performance rather than gaming. If you are looking for a good mid-range PC that can be used for a variety of different tasks, check out the Best $700 to $1000 Desktop PCs. August 21, 2013 - HP tried to do something a bit different with the ENVY 700-060 but it does not quite work out as well as it could. The system does offer more than enough performance for the average user but it fails to provide the performance for those looking to do gaming or demanding tasks like video editing. This is a shame because it is unique in offering a dedicated SSD storage drive at this price point but it sacrifices a bit too many features. HP's ENVY product lineup was once about high-performance gaming systems. The latest models have been more about high general performance and less about gaming. The latest revision is the ENVY 700 which is based on the new 4th generation of Intel Core i processors. It features a design that is more akin to the previous ENVY h8 than the ENVY h9 Phoenix which is a good thing as the h9 featured a bit too many lights for the average user. Surprisingly, the HP ENVY 700-060 is based around the Intel Core i5-4430 quad-core processor. This is the lowest grade of the new 4th generation Intel Core i processors currently available. It is a decent processor for most users but it is slower than most of the competition that is offering the faster i5-4670 or the Core i7-4770 processors. This will really only impact those users that are doing extremely demanding tasks such as desktop video editing. The processor is matched up with 10GB of DDR3 memory which is a bit unusual. It is compromised of two 4GB and two 1GB modules to get that result and the performance difference between it and 8GB is negligible. Those looking at future memory upgrades will want to remove the 1GB module pair. One of the big advantages that the HP ENVY 700-060 has over the competition is the use of a solid state drive. Some companies have elected to use some small SSD for the cache but this system uses a 128GB as the primary boot and application drive. This is a relatively small drive and can quickly fill up if users store their data files there. To combat this problem, HP has also included a secondary two terabyte hard drive for storing your larger data files and keep the SSD for the operating system and applications for the best performance. This provides it with a larger amount of storage space but also some exceptional performance when booting up the system in roughly ten seconds and loading applications. If you want to add extra storage space, HP does provide the system with four USB 3.0 ports for use with high-speed external storage drives. A standard dual layer DVD burner still remains in the system for playback and recording of CD or DVD media even though it is not as relevant now. The big flaw with the HP ENVY 700-060 is the graphics system. Pretty much every competing system at this price point includes a dedicated graphics card, even if it is a very low-end one. 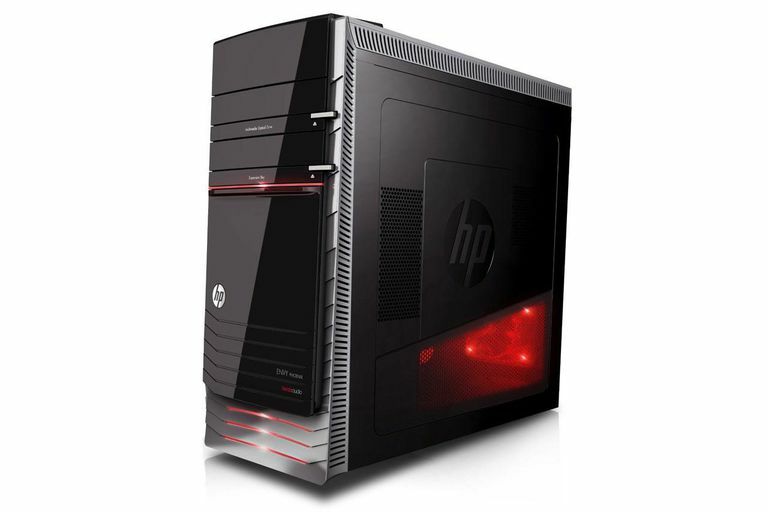 HP has elected instead to rely on the Intel HD Graphics 4600 that is built into the Core i5 processor. This is a slight improvement over the HD Graphics 4000 found in the previous generation of Intel processors. It still lacks any significant 3D performance such that it can really only be used for older games at low resolution and detail levels. What it does provide though is some nice acceleration for video encoding when used with Quick Sync enabled applications. Now there is space within the system for installing a dedicated graphics card and the power supply is a decent 460 watt meaning that it can handle some decently strong performing 3D cards. HP has been including wireless networking functions in many of the desktops for several years now. This has always been nice and convenient for dealing with connecting the computer to a home network. What is disappointing to see is that HP only includes a 2.4GHz capable Wi-Fi solution. This means that it can't use the less cluttered 5GHz spectrum for 802.11a or 802.11n standards. This dual-band support is becoming a bit more common in the desktop space now as the costs are fairly minimal to add it. Priced between $800 and $900, the HP ENVY 700-060 had a fair amount of competition. The closest competitor that includes a solid state drive for caching is Acer with its Aspire AT3 but the system does cost $1000. That provides it with a faster Core i7, 16GB of memory and an NVIDIA GeForce GT 640 graphics card. Now for those that don't necessarily care about the solid state drive, there are a number of options including the ASUS Essentio M51AC and Dell XPS 8700. Both of these are in the same price range as the HP system but come with a faster i7-4770. The ASUS does not feature any Wi-Fi networking but has a GeForce GT 625 graphics card. The Dell on the other hand only has a one terabyte hard drive but features a Radeon HD 7570 graphics card and dual-band Wi-Fi networking.